A great kidney-tank with anatomically formed backrest elements. Multisport back protector with 4 ribs and wide strap. Continuously adjustable with Velcro. Removable and washable inside padding so provides the necessary impact damping. These protectors are different from the products of other manufacturers, by the attached plastic sheets (the number varies depending on the size), especially protect against injury from fall to sharp obstacles. The resulting energy is distributed over a large area by the underlying multilayer foam buffer. UFO Protections products are made in the best materials and are very well known and popular with the most extreme athletes in the world. 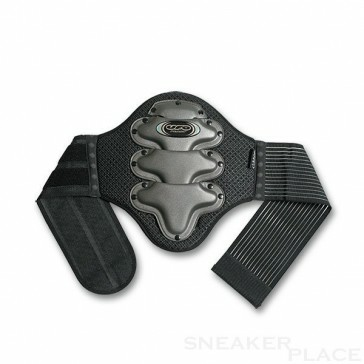 In order to prevent slip in addition to the wide hip belt fix two detachable shoulder straps the protector on the body. The inside of the body adjacent pad can be removed and thus washed.